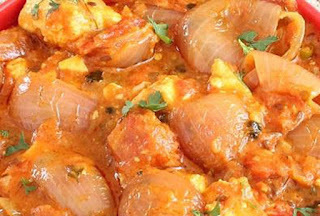 Paneer do Pyaza uses the onion in double the quantity hence the name "do Pyaza". This Paneer curry is rich and tasty and very easy to make. You can add your lunch box. This dish is very popular in north India and this dish makes a perfect menu for any occasion and can be servedwith rice or paratha or Chapati. 500 grams Paneer(cottage cheese) 4 Onoin medium (cut in 4 pieces and open ) 3-4 tbspn Oil 1 tespn jeera 1 tbspn Ginger-garlic paste Crushed green cardamom ½ tespn crushed black paper 1 stick cinnamon 1-2 Bay leaf ½ tespn Red chilly powder 1 Chopeed tomato 1 tbspn fresh cream 1 tbspn coriander powder ½ tespn turmeric powder ½ tespn garam masala Salt to taste Chopped coriander leaves and Julian ginger for garnishing. Heat oil in a pan, add cumin seed, when it starts to splatter add bay leaf, ginger-garlic paste and onion.